Instrumental music comes in many strokes, some illustrious and symphonic and others more rough and experimental. Marijean has created a collection of songs that fall into place on their own accord, soft-spoken with a slow burning feeling of intensity. 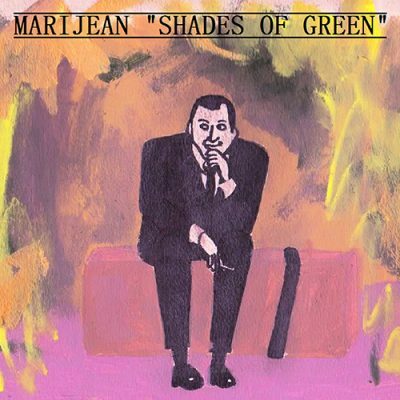 In fact, the cover of Shades of Green is a painting of a man in a dapper suit looking bemused and perhaps unaware of the billowing, colorful fire consuming his surroundings. The sarcastic “Everything is fine” message depicts a sense of dark humor that gives the album an endearing edge. Using an impressive range of instruments and sounds, the tracks are textile, moody and meditative. Husky, willowy and everything in between, the narrative wanders at its own pace– telling a story that is as unconcerned with time and space as the man ignoring the spitting flames. Shades of Green opens with “Waking,” a hushed, optimistic track and one of just a handful on the album that features vocals and lyricism. Though it’s hard to make out exactly what is being said, the sentiment has a bittersweet twinge and leaves you wanting for resolution. The album moves seamlessly into “Wordless Song,” a variation on the same thought. With similar musical elements as the first track, it seems to answer the question that “Waking,” posed. In “Walking Backwards,” Marijean laments, “I find this world absurd / I never understood it / But I thought I could.” In a cynical yet refreshing tone, we hear a struggle to get over romantic interests and feeling disoriented in life’s cycles.